2 pounds fresh strawberries, cut into 1/4-inch slices. Grease two 9-inch round cake pans. Line bottoms with parchment paper & grease paper. Sift dry ingredients onto wax paper & set aside. Combine buttermilk & vanilla & set aside. Beat butter & sugar in a large bowl for one minute. Beat in egg whites one at a time - takes about a minute. On low speed, alternate adding flour mixture & buttermilk mixture, ending with the flour. Spread into pans & bake 20-25 minutes. Cool 10 minutes and remove from pans to cooling rack. While cake is baking, put strawberries and sugar into a large bowl, stirring occasionally, mashing a little. Whip the cream with sugar until firm. Layer half the berries & juices on bottom cake & cover with whipped cream. Place the second cake layer on top and cover with remaining berries & their juice. Cover the whole cake with remaining cream. Keep refrigerated. Note: It's easier to cover the cake using 2 cups (1 pint) of whipping cream. I've done it with 1 1/2 cups but it's a tight squeeze. So feel free to use an additional 1/2 cup of whipping cream (one pint total) with an additional tablespoon of sugar. Can I Make It In Advance? Can I See More Photos? Click here. 239 Comments on "Strawberry Cake"
This is one of the best cakes EVER! I make it frequently during the year, and it never disappoints! I find it to be light and tasty, and so very satisfying! In fact, it is being served for dessert this Easter! Omg i made this beautiful cake for my daughters 29th birthday dinner.it was so delicious.thank you for recipe will make again! Hi! I made this cake yesterday and it was delicious! However, the cake layer itself was quite tough and needed some pressure for slicing. When we sliced the cake, it just pushed all the filling out the sides. Any idea where I could have gone wrong? This is a delicate creation and should be sliced slowly and with a very sharp, preferably serrated knife. I slice mine with a short back and forth motion not to put too much pressure on the cake. I hope that helps. I made this before and it was delicious. I wrote the recipe down rather than save on phone. When I started to make again i had written down to beat 8oz of cream cheese with small amount of sugar and fold whipped cream into it.do you have any idea where u got this,maybe a comment??? It’s not familiar and I have no recipe anywhere that uses that much cream cheese. I hope your cake turned out. I’m making one right now. what amounts to make a 12 x 18 sheet cake? Do you use, can I stabilize my whipped cream? How, what? It needs to last a little while to travel with me? I need 2 separate layers or a thick cake to slice in half for the middle cream and berries. I know this is late but for others wondering, I always make whipped cream frosting and add a tablespoon or two of jello instant pudding mix to stabilize it. I usually use vanilla or cheesecake flavor. I just wrap it (left over pudding mix) back up and keep it for the next time I make frosting so it doesn’t go to waste. I made this yesterday for my Dad’s birthday dinner. It was delicious. The cake looks like it would be heavy once frosted with the whip cream, but was light, wonderful and perfect for a hot summer day. Everyone really enjoyed it and Dad made sure he took some leftovers for later. My husband asked if I kept the recipe, always a good sign. Hi! This recipe looks sooo delicious!! I’m afraid that the strawberry filling will make the cake soggy, though. I’ve filled cakes with fruit/jam before and the recipes usually say to put down a thin layer of buttercream before adding the filling. Any suggestions or feedback about how it comes out? Thanks!! Looking through some of the comments might be helpful. I would give this cake 5 stars. Is the best strawberry cake I have ever made. When I made it everyone in my family absolutely loved it. The cake alone was excellent,and the whipped cream for the frosting was amazing. This is the 2nd time I’ve made this cake. I’m making it for someone special for her birthday. Picked some fresh strawberries today in Georgia and found your recipe on Pinterest. Made the cake just as you published it. Cut my cakes in two to make four layers. I am not a big strawberry fan except when they are fresh picked. So juicy and sweet unlike store bought. Nothing compares to fresh whip cream. Yum! Will make this cake again. Absolutely scrumptious! Even better next day. I served it cold. So refreshing. Thank you for sharing. What kind of cake mix could I use if im not good at making the cake from scratch? I would use a white cake mix, milk in place of the water and 1 stick of butter melted and cooled in place of the oil and 4 eggs. Is it best to make this cake the day needed or a day before? How long will it last in the fridge? I make mine the day needed. And please use the link at the bottom of the recipe for how long it will keep. I have been making this cake so many times whenever my relatives have a birthday. I treat it as very special cake. I usually make the cake day before and make the rest later before serving. This way, the cake has soooo much added flavor! I would like to try this recipe but would could it be covered in fondant? I think you would run into trouble because the top layer of strawberries is very wet and soft and would not tolerate being topped with anything heavier than whipped cream. Miss Jones i really love all your recipes because they are healthy not to much sugar or fat. Both desserts and meals i saw one of your desserts strawberry cake. Is it the same as strawberry short cake or is there difference. I have made this cake many times and it is no way even close to strawberry shortcake. I do not eat strawberry shortcake, but this one? I can eat one by myself in one sitting. LOL> seriously! and my relatives love it so much they keep asking me to make it for them. Jenny..you state in your recipe to use 1 1/2 cups of sugar. Is that all for the cake or does that include what I use to mix with strawberries? I’m an idiot…I see it now. I would like to try this delicious cake in loaf pans – split for two layers to go to two homes. How long should I bake batter in loaf pans? I’m thinking I’ll need three loaf pans and we can enjoy one! I have only made it in cake pans so I can not help but you can probably find something similar online to see the bake time. It’s the white part of the egg that does not include the yolk. Look for an instructional video on how to separate egg whites. What would happen if you used the whole egg? Color of the cake would be more yellowed instead of white. I am making this right now and have been baking the cakes for 30 minutes now, and they’re still not done. Any idea why? Mine also took 3O min to bake. Think it was due to the fact that I used the whites from jumbo eggs so perhaps too much liquid. I cooked mine for 30 -35 minutes as well. And I used large eggs. Excellent cake, this recipe will not disappoint you. Very light and fresh tasting. Loved it and will be making it again. Strawberries are not locally fresh this time if year. I’ve read from other expert bakers that it’s better to use frozen organic strawberries if local are out of season. Would frozen work in this recipe? I saw a cake just like this one at the Whole Food store, so I decided to buy a piece. It was actually the same cake, except they used some other kinds of fruit. I believed they used blueberries and blackberries. it was good, but the cake part was not as tasty as this one! Hi! This sounds delicious! I’m curious, instead of spreading the strawberries over the cake and layered, could the strawberries be used as for a “poke cake”, instead? I forgot the buttermilk, is 2%milk okay? No. See “Substitutions” in my blog. Hi Jenny – In your strawberry cake recipe, you instruct to grease 9″ pans, line with parchment paper & grease paper. However, in your Easy One Bowl Chocolate Cake recipe, you instruct to grease the pan, line with parchment, but “do not grease the paper”. Is there a reason for the different instructions? I just want to understand so I get the best results. Thanks! PS – I used to watch your talk show and loved it! I think all buttermilk is cultured. The one I use (Knudsen) is labeled “cultured” so yours will work just fine. Do you have a video for the Strawberry Cake? Jenny i really like cooking your recipes. My mom really enjoys them to.This cake that I made was so AMAZING.I am serious I have never ate this kind of cake before.You should make a video about how you baked it.Your videos are so fun and easier to watch.THANK YOU SO MUCH FOR THE RECIPES. You are an AWESOME cook. Jenny, have you ever made this with gluten-free flour? I have no experience with gluten free baking. I use gluten free flour in place of traditional flour. The one I am using now is Bob’s Red Mill for baking. You can replace with this flour cup for cup when using your own recipies. However, gf flours tend to be a little drier than the other. You might want to adjust the flour when mixing it in. Most all of my recipies turn out wonderful. I have learned to tweek each recipe as I go. most of them work well just going with the amount in the recipe. I hope this helps. is how long can i keep pure vanilla in the fridg.before it goes bad. Pure vanilla extract does not need to be refrigerated and the bottle I just opened is good for three years. There should be an expiration date on the bottle. I made this cake last night for my family, and while the like the flavors and textures, they found the vanilla cake to be not quite sweet enough. How much sugar should I add to ramp up the sweetness of the cake? Adding or reducing ingredients in baking can leave you with a disappointing result. Why not use a different cake recipe that you like and you can just follow my strawberry and whipped cream process. By the way, you can add as much sugar as you like to the whipped cream or strawberries, but not so easily to the cake batter. Hello , my question is do you cook the strawberries and sugar ? i’m making a lemon meringue pie using a sugar free fat free pudding. this is one 85 year old that loves your recipes. The meringue recipe I use DOES require baking but there is a different kind of meringue that does not need baking. It’s Italian meringue and it’s a bit of work but you can find recipes for it almost anywhere. I don’t make it so I don’t have a recipe. If you don’t want to bake, another idea would be to use whipped cream as a topping. Real whipped cream, made by beating whipping cream with sugar, is delicious and easy to make, and it’s much healthier than cool whip. I made this last night, and oh my, did everyone love it. I did follow the note and used 2 cups whipping cream and the extra sugar. I knew we would like a lot. I also used an extra 1/2 pound of strawberries for the same reason. We love them in the summer. I anticipated that assembly might be a bit messy, so I used a 9″ springform pan. It was perfect. Even better for serving. We cut the cake into the desired sizes while it was still in the pan and then undid the sides and served. No squishing out of strawberries and cream. Thanks for a great recipe that is definitely added to our summer desserts to enjoy. Great idea to assemble cake in springform cake. You can frost the sides after taking out of springform pan just before serving. Thanks for the tip. How long did you cook it in the 9″ springform pan? Thank you so much for a terrific recipe. Used local berries and it was delicious. The texture of the cake was lovely and light (even though I used 2 eggs instead of 4 egg whites). My family loved it and I always prefer Whipped Cream to any other frosting! should doneness be tested with a toothpick? can the batter be overmixed? should the whipping cream, bowl and beaters be placed in the freezer for say 10 minutes to achieve a temp between 35 and 50 degrees F? how best to remove cake from pan to rack after resting for 10 minutes without breaking up the cake? should doneness be tested with a toothpick? YES, THAT’S A GOOD WAY TO TEST A CAKE. can the batter be overtaxed? NOT IF YOU FOLLOW THE RECIPE EXACTLY. should the whipping cream, bowl and beaters be placed in the freezer for say 10 minutes to achieve a temp between 35 and 50 degrees F? IT’S BENEFICIAL BUT NOT ESSENTIAL FOR THEM TO BE COLD. how best to remove cake from pan to rack after resting for 10 minutes without breaking up the cake? PUT A COOLING RACK ON TOP OF THE CAKE AND FLIP THEM BOTH OVER. THE CAKE WILL SLIP OUT OF THE PAN ONTO THE COOLING RACK. I made this cake for my granddaughter’s 3 birthday. It was a hit! Light, but dense at the same time. More like strawberry shortcake, but better. I made a 9 x 13 instead of a layer cake. It was beautiful and delicious! A great cake for summer. I would love to make this in a 9” x 13” pan. Does anyone know how long I should bake it in a sheet pan? I’d like to make this cake next weekend for my daughter’s fourth birthday. We live in Denver (elevation 5,000 feet). Do I need to modify the recipe for high altitude? If you live in Denver you probably have more experience with high altitude baking than I do (which is none). However, there are lots of internet resources for high altitude baking, which should prove helpful. Will this cake keep well in fridge if i make it the day before? Relly it is secssefull more than any receipet. I try all of them . I made this cake this time last year for my birthday. Loved it so much just finished making again today. Love this cake! great cake! Making it again for Mother’s Day! I have several egg whites left over after making your chrustickies, which were delicious, and thought this cake would be great but am looking to make cupcakes instead. Have you ever done this as cupcakes, if so what are the alterations to the recipe? Or Do you think I could cook for same amount of time? I have never made this recipe into cupcakes but you might be able to find how to use a cake recipe for cupcakes on the web. Good luck! It’s powdered buttermilk. The ingredients seem to be all natural and the shelf life is several months, up to a year. Has anyone tried it? It gets rave reviews on Amazon. I’m really tempted to bake the cake using this product just to see if it works! Yes! I’ve used it a lot for bread and buttermilk pancakes. It’s delicious and keeps well in the fridge between uses. Thanks Autumn. I just purchased a can at Jet.com. which was much cheaper than Amazon. I will try to bake the cake this weekend! I made the cake this weekend using the powdered buttermilk and it turned out beautifully. It was my first attempt ever at baking. You can also use milk and vinegar to make your own buttermilk substitute. Google it! Or if you have Pinterest, do a search. I do this all the time and it works out great. Here in Maine we use buttermilk in about every cake & pancake we make.Surprising to read u don’t have it.R U in the South?My son lives in OK. & can’t seem to find alot of products we have.It has A very good taste to it.Good luck on ur cake,I am going to try this for my grand daughters Birthday day!! It was great!!! Only problem was I also couldn’t get the whipping cream to stiffen will it taste the same if next time I just use whip cream from the can? Or are they two diff things? They are very different. Just look at the ingredients in each one. Real whipped cream is light as a could and is worth making. I have never had it not stiffen so as long as it is 100% whipping cream and you have an electric mixer, it will stiffen. Jenny when you say sugar for the whipping cream is it powdered sugar or reg. sugar. ? Thanks. “Sugar” is always granulated sugar unless it’s specified as powdered sugar. Hi Veronica, did you add the sugar before whipping the cream? I see that Jenny says to do that, however I have found putting the sugar in before whipping the cream made it so it would not whip. Try adding the sugar after whipping the cream. Hope this helps. yes, I always whip it first till almost there & then start slowly adding the sugar.But I also put my bowl & beaters in the fridge to get cold,it helps,also make sure the whipping cream is cold.Cool whip isn’t a good sub for things like this. Just found u loved u way back when. Can’t wait to try it all. Keep up the funnies. Just made it this morning for a family get together barbi. The cake was so easy to make and the strawberries mixed in sugar looked so glossy and Devine. Will be taking it to sister in laws this afternoon…..will keep you posted! I made this cake for family and it was awesome ! Loved it so much, I am making it again for my daughters birthday this week and then for Easter. I made this cake for my mom’s birthday last year. This is truly one of the best cakes I’ve ever made or eaten. I lost the recipe and am so glad I found it again. This cake is soooo good! This looks delicious. I am going to make it for a birthday party this weekend. My questions: if I make it the evening before and layer it, will the strawberry juice and whip cream cause any sogginess? The other thing is I have to drive two hours to the party with it. It’s a very cold winter where I live but will be warm in the car. What do you think about prepping it and freezing it/ then letting it thaw on the way? Or if it won’t have sogginess I could also put it in my Tupperware cake carrier in a cooler of ice. My other option is to wait and do this cake when I have people coming over and am staying home! It looks so delicious. This is really not a good cake to make in advance or to travel with. It’s best served the same day and it needs to be kept refrigerated because of the whipped cream. I would trust your gut and save it for serving at home. My tip is to assemble the cake on location if possible. I never hesitate to arrive a few minutes early for an event with hand mixer in tote. Makes for enjoyable pre-event conversation and creates a festive atmosphere. Everyone will be curious and will tout your praise as a clever baker and your dessert will be fresh, lovely and delicious! 1 1/2 cups – it was amazing and gone by the next day – a keeper recipe. That sounds great. I’d like to try it with oil instead of butter too. Just wanted to recheck with you — did you simply use 1/2 cup of oil instead of 1/2 cup of butter? Yes TeeCee 1/2 cup of oil – I think it was canola oil that I used. Thank u for the oil tip.I use coconut oil alot so thinking i will sub with this. This recipe is amazing, so happy I found it on Pinterest! I will make it forever, it’s so light fresh and sweet and the lightly sweetened whip cream just pulled it all together! I even used the recipe to make cupcakes! Thank you! Good day, thanks for this great strawberry cake recipe. I had a request, mother-in-law, to make a sheet cake for the grandaughters birthday. The only problem was; the sheet cake was 13″x19″! And one other minor problem; I never made a sheet cake before! So I tripled this recipe, minus a couple eggs. It poured easily into the pan and the cake baked up to 2-1/2″ high! 2 pounds of strawberries and 1-1/2 quarts of whipped cream for the topping. Everyone was smiling and waving at me, telling each other how good the cake was. Great recipe, tasty spongy cake, great with strawberries and whipped cream. I would keep it simple and make the cakes per package instructions. Then follow my recipe with the berries & cream. Skip the jam, cream cheese & yogurt and stick with just the recipe. The less changes you make the better. Omg!! I have made this cake already several times… its a definite keeper in my house… i absolutely love it… its cooling now as i type. I have also shared the recipe with family and they too love it!! I’m no true baker but this recipe was pretty simple. First time baking a homemade cake and cakes didn’t rise.used ingredients as stated all within date..had trouble sifting and was using a hand mixer..could any of that have caused the problem? 1) Did you use all-purpose flour? 2) Did you use real buttermilk? 3) Were all your ingredients at room temperature? 4) Was the butter softened at room temperature or was it microwaved or melted? 5) Did you use granulated sugar? 6) Did you preheat your oven long enough? It should take at least 20 minutes. Do you know the oven was at 350? 7) Were the pans 9-inch round? This cake has worked for just about everyone so please let me know some specifics and I will try to help. Maybe a couple other issues to consider: Is your baking powder and baking soda fresh? Old baking powder can really mess with one’s baking. Come on , people. Respect the recipe as written. If you all want to make changes and experiment with the recipe, go for it. Leave Jenny alone. She gave us her recipe as is ; its up to you, to decide for yourself , any additions, substitutions, etc. I’ve made this cake several times for co-workers birthday’s and it’s always a hit! Would like to make it for my daughter’s baby shower. But need the measurements for a 11×15 sheet cake. I wish I could tell you but i have only made this in my 9-inch pans. I do know that if you change the pan size, you need to know the volume of the pans and you may also need to adjust the baking time. I found some baking pan conversion charts that might help you figure it out. Good luck! I made this cake last week after seeing it posted on Facebook. I later found it online and made it to surprise my husband who is a strawberry shortcake fan. It was easy to make and he loved it! I will surly make it again. I did make the extra cream that was suggested and it worked out really well that way. Blessing and Enjoy! Couldn’t I use a 9 x 13 cake pan and just later it that way? Please see Darlene’s comment below. It looks like you can use a 9 by 13 pan. I have only made it with strawberries because they are soft and create a lot of juice. Great recipe! Will be making it again, for sure! Thank you! 3 different separated tins sorry my commuter auto correct but not doing a good job. To bake in one 9-inch tin you would have to cut the recipe in half but if you try to cut it to stack and frost you may have trouble keeping the pieces together. (I just tried it last night with a white cake (a 9-inch round cut in half, put filling in the middle and the top piece kept slipping off). To bake in 3 separate tins, are they cake pans with straight sides and what size are they? Thank you so much for this wonderful recipe!! The cake was so moist and a perfect match for the strawberries and whipped cream!! It was a crowd pleaser!! Hi jenny, I have not found low fat buttermilk, only fat free o whole milk which one can I use? o what I need to do? Thanks. Please see the “substitutions” posting in my blog for buttermilk substitutes. So can I use whole buttermilk in this recipe? Hi Jenny, I read in the substitutions how made buttermilk if you don’t have but I do, is just is not LOW fat , you said use real buttermilk better so I’m confused because this recipe said LOW fat buttermilk if I want to make it…. you don’t specify the kind the milk to use with the yogurt, whole? 1%? or 2% milk to make LOW fat buttermilk? for this specific recipe. Sorry but the recipe said Low fat buttermilk. I appreciate that you are being exact. Whenever I find info on making your own buttermilk they never say what kind of milk so I didn’t assume, but I am guessing that it’s usually whole milk. However, to make it I would try using 1% or 2% milk to keep the cake lower in fat. It’s hard to answer some questions when it involves changing one of my recipes because I only use real low fat buttermilk in my baking. Baking is such an exact science, sometimes even the smallest change can cause a recipe to fail. So I believe you have three choices: One is to use full fat buttermilk (not what I would use), two is to make your own buttermilk with 1% or 2% milk, and three is to use the milk/yogurt combo using 1% or 2% milk with 2% low fat yogurt. I am not a professionally trained chef, just a home cook, so I can’t guarantee my recipe when changes are made. I’m sorry I can’t be more helpful. By the way, sometimes it takes looking in several different grocery stores to find low fat buttermilk so I’m hoping you may find some at some point since it’s really great for baking. Please let me know how it turns out. Thank you so much for all your effort to answer my concerns…I will let you know….. still two more stores to look for low fat buttermilk. It’s true that most buttermilk sold in stores today is low fat but some diaries still make regular cultured buttermilk, which is higher in fat, but they are not as easily available. Can whole eggs be used rather than egg whites ? I have never used whole eggs but I think it would make the batter too thin and higher in fat so it might not turn out. You could try a different recipe for yellow cake and then use my strawberry/whipped cream finish. This was fantastic! I served this for Mother’s Day today and it was a hit. I used the whole pint of heavy whipping cream but didn’t bother frosting the sides. I just added generous portions to the middle and the top. It looked like one big shortcake, and tasted that way too! I will make this again for sure! Omg! Today was my birthday. I have been looking for a strawberry shortcake around here, and couldn’t find any place that makes a nice one with cake…like my mom used to make for me every birthday. I cut the recipe in half and divided the batter into 2 pans. Then i cut them in half and made a four layer, half cake. Thank you so much. This was fantastic. Brought back memories of many great birthday cakes! Happy Birthday! I love the half-cake idea. I’m really not sure since I don’t ever see full fat buttermilk in my stores but I understand it can be very thick, almost like yogurt and then the batter would be too thick. I’m also not sure if the extra fat would make the cake too heavy. I wish I could tell you for sure but I simply don’t know. If you’re going to try it, and if it’s a really thick buttermilk, you might try thinning it a little with some reduced fat milk. Another thought it so use a different white cake recipe and then follow with my strawberry & whipped cream part. Thanks Misty I’ll give that a go when am making it at the weekend I will let u know how I get on thanks again for your help. This is the second time.e in two weeks I’ve made this cake. It was a delicious addition at Easter and now I’ve made it for some wonderful teachers at work. I went to use my round cake pans and found they were two different sizes…..not good. I’ve made it both times in a 9×13 instead out of necessity and with a slightly longer baking time. Still wonderful and delicious. Lacks the “special occasion” presentation of a layer cake but who cares when it’s this easy and the flavors are so fresh and light? Will definitely be making this again! And again! I am making this as I am typing to you Jenny. I am trying to whip the cream and you said till firm mind is still liquidy and away when does it become fluffy? I’m leaving in 20 minutes and I’m hoping this whip cream looks like yours in the picture but it’s not. How long do I mix it for with my handmixer? I’m wondering if you are using a different cream. Only “whipping cream” will whip up & be thick. If it’s any other kind of cream, like half-and-half, it will never whip up and be thick. It takes me about 5 minutes to whip the cream. Let me know if I can help further. because she loves strawberry cake as much as I do. I have not given it to her yet, because my son works grave & he is a sleep. We will celebrate her birThday around 5:00 pm tonight when he wakes up. I will let u know how it turns out. This is my first time as a man trying to make something from saratch. I hope it turns out ok.
She’s a lucky wife. I hope it turns out. Happy Birthday, Kimberly! Hi Jenny, can I bake the cake the day before,or will it be soggy. Please see my response to Ashley below…. Awesome cake, its creamy and looks delicious. I will try it next. I always use to Order cakes online from Monginis online cake shop. Thanks for the recipe. made this cake twice. First time with strawberries, second time I mixed strawberries, raspberries, blackberries and blueberries. FANTASTIC both times. Now a family favorite. Might try peaches next time. The cake is not supposed to be flat so I don’t know why it didn’t rise. It could be from not using real buttermilk or maybe expired baking powder or soda. It’s hard to say. If you bake all the time you could try using your own recipe for white cake and then use my method for the strawberries and whipped cream. It’s not easy to substitute for buttermilk. Milk will not give the same result. Buttermilk has an acid nature so you could try something like yogurt, which you can thin with a little milk. In my opinion, there is no good substitute for buttermilk in baking. Some people say you can create buttermilk by adding 1 tablespoon of vinegar to 1 cup of milk and let it stand for a few minutes but I have not found that to work. If you can’t get buttermilk, you could bake a different cake recipe and use my method for the strawberries and whipped cream. I hope this answer is helpful. Please let me know. I wish I could help you but I don’t think you can make whipped cream out of low fat milk. Maybe if you do a little research you can find an expert in your own country who has a solution. Our buttermilk here has no flavor and I think your chaas is flavored and may not work for a delicate cake. I’m very sorry I am not able to be more help. You cannot use the Indian buttermilk. The buttermilk that this recipe is talking about is very different. Making this buttermilk at home is easy. I add 1 tablespoon of white vinegar to 1 cup low fat milk and keep it aside for 5 to 10 minutes. It curdles and becomes thick. You can do research online for how to make buttermilk and the proportions. The proportions that I found online doesn’t work for me so I use 1 tbsp for a cup of milk. I made this today for my dad’s birthday. The whole family loved it. This was the first cake I’ve ever made that wasn’t from a box. I will make this again. Thank you for the recipe. Do you have any tips on adapting this recipe for cupcakes (bake times)? I’m sorry I wouldn’t know how to make this into cupcakes. But otherwise..the cake looks great…i think its going be amazing..!!!.. Yes. It should always be refrigerated because of the cream. If you have a dome to put over it that would be good but it should be covered. If you don’t have a dome or cake cover, you could try loosely covering with plastic wrap (not foil). I hope he likes it. WOW! This cake is amazing!! Kids loved it, mom-in-law loved it — especially me, it’s my new go-to special occasion cake! Thank you Jenny. You rock!! Do you just put parchment paper on the bottom of pan and not around edges? Also, could I use icing instead of the whipping cream or would it just taste off? The parchment only goes on the bottom because you can always run a knife around the sides if the cake sticks. I don’t know about using icing on these soft, macerated berries but my guess is that it would be too heavy, and also probably too sweet. what about mixed berries and should i adjust the amount of sugar i use? I have only made this cake with strawberries, which are the juiciest and you need that juice to soak into the cake. I can’t say how it would turn out with other berries, maybe some raspberries, but I don’t think blueberries would work because they are firm. Hi Jenny? Do you think this would work with blueberries? I don’t think so because blueberries will not generate the kind of juice you get from strawberries and they won’t get as soft as strawberries when exposed to sugar. I had been searching for a strawberry cake/strawberry shortcake recipe that was similar to a strawberry cake that we had at Christmas gathering and I think this one nailed it on the head. It was delicious & perfect. A little time consuming with mixing everything in separate bowls…. But DELICIOUS! ok so i went to store bought everything needed got home spent an hour making this recipe and was so disappointed. would have been cheaper to buy betty crocker cake. worst cake ever! What exactly was wrong with it? Did you use real whipping cream and the whole two pounds of strawberries? Did you use real buttermilk? Did you make any substitutions? Maybe one of my instructions was not clear so if you can elaborate, I would like to try to figure out what went wrong. Savannah, I am curious for your reply to Jenny’s questions. I am thinking of making this cake for a birthday party and would love to know what went wrong with your cake so I don’t make the same mistakes. Did you follow the recipe exactly? Thank you! About to make for my husband’s birthday party tomorrow. Boup, will leave comment’s tomorrow from 2-40+ year olds. Can’t wait! This looks like what I’m looking for-an old fashioned white cake with strawberries and whipped cream frosting. Just fyi, when a baking recipe fails it’s almost always because the recipe was not followed exactly. If you don’t make any changes or substitutions, even the smallest change, or use a different size pan, or if you don’t use real buttermilk, you will probably not get the best result. Baking is an exact science so if you follow the recipe exactly, I think you will love this cake. There must be something wrong with your taste buds if you think a Betty Crocker Box cake is better than this homemade cake. Hello, delish looking cake. Just a hint for those who need the frosting to hold up a couple days or even a week, I used to make pies for a restaurant and found one tbl of vanilla or white choc instant pudding and two tbl conf sugar per cup added before starting to whip makes a delicious stable frosting.the coconut cream pie looked as good on day 7 as the first day. I tried this cake recipe twice and my whole family just love it love it love it! But since then we switched to gluten free diet, do you have any advise on how to substitute? Thanks! Hi, as i can’t stand butter (don’t even touch it), can i replace it with something else pls? With this recipe, I don’t know of a replacement. You could do the same thing with an angel food cake, or you could look for a different cake recipe without butter and use my strawberry method and whipped cream. I am a beginner and i would like to know whether can i substitute milk instead of buttermilk. Or can i know the ratio of curd+water to make the butter milk. Thank you. Unfortunately milk is not an effective substitute for buttermilk in baking. Buttermilk’s acidic nature reacts with baking soda to produce light and fluffy cakes and other baked goods. The closest thing you could try is using a combination of yogurt and milk, something like 1 cup of plain yogurt mixed with 1/3 cup of milk. I can’t guarantee that it will work but it’s what I would try. As for making buttermilk at home, I have no experience with that so you may have to find a recipe on the internet. I hope that helps. A buttermilk substitute can be made with lemon juice/white vinegar and milk. It won’t be as thick as regular buttermilk, but it’ll work the same way and react with your baking soda. I usually add about a tablespoon of lemon juice to a cup of milk. Just let it sit for a few minutes and then you can use it all. Hi Jenny. would it make a difference if the cakes were made with pastry flour and egg yolks? By “pastry flour” if you mean whole wheat pastry flour I do NOT think it would work. If you mean cake flour, which is a very fine white flour,that would work but you would have to increase the total flour by 1/4 cup. Using egg yolks only and no whites would not work – you need the egg whites. I made this cake two days ago and it is still good today! Could you use a homemade cream cheese frosting instead of the whipped cream to frost the cake? I don’t think so. Whipped cream is light as a feather and even then, when you frost the layers, which are topped with strawberries, it tends to push the strawberries around so you have to frost it gently to keep the strawberries in place. Cream cheese frosting is so much thicker and heavier that when you try to cover the berries they would probably slide off the cake. Planning to make it for a baby shower for display. Will the frosting be good for 2 hours without melting? I think 2 hours would be okay as long as it’s not in the sun or in a very warm area. But I think 2 hours is the limit. this recipe looks wonderful. I’ll try it when the local strawberries come in soon. Have you ever tried using unflavored gelatin to stabilize whipped cream? It works well without changing the flavor of the cream. 1tsp. Gelatin softened in 4 tsp cold water, then heat til it dissolves. Add to 1 cup cream with 1/4 cup powdered sugar after it has been beaten to stiff peaks. Thank you for this recipe. I love anything with strawberries! would this strawberry cake recipe work as a sheet cake a 12×17 sheet? I don’t think so. I believe it’s best to have the same amount of volume if you switch pans for baking. A 9-inch round pan has 63 square inches so two of them would total 126 square inches. A 12 x 17-inch pan has 204 square inches so it would be too big. You might be able to do it with a 13 x 9 pan, which has 117 square inches. Softened butter just means any butter that is left at room temperature for an hour or two so it is soft enough to add to your mixture. Refrigerated butter is too hard to mix into other ingredients. If you can’t get strawberries, you might be able to use sliced ripe peaches or nectarines. The recipe calls for 2 lbs of strawberries, is that correct? Or is it 2 cups? 2 lbs seems like a lot. Jenny 2 los is not alot. Strawberries are big in size and pretty big in size! I made this about a month ago for my family and they loved it! My husband was very bad about sharing it :-). However I found that there was not enough whipped topping to cover the cake. Lots of bare spots,so this time I am doubling the amount. I have the cakes in the oven now and it smells heavenly! Will try to post a picture when it is all done! I made the cake too. Delicious. If your in a hurry then get the Duncan Hines white cake. Works just as we’ll. When referring to whipping cream is that the heavy cream like in the store by the milk or like cool whip n the container? Plz send me an email for reply! Thank you! I can’t wait to make rhis! I use “heavy whipping cream,” the one you find in the dairy aisle in the store by the milk. I don’t consider Cool Whip a food and would never use it for any purpose. You might feel the same after looking at the ingredients. There’s nothing like real food! I love your comment about cool whip!! Real whipped cream is so very easy to make that i do not understand why anyone uses cool whip. Can’t wait to try this cake too!! Fancy Strawberry Shortcake, which is a favorite of my family! I always use whipping cream with 1 teaspoon clear vanilla, 3 Tbls. Powdered sugar, & 2 tsps. Instant vanilla pudding to stabilize it so it doesn’t break down & stays firm for several days. That is per cup of whipping cream. I will be baking this cake for my sisters birthday party. When would you reccomend I bake it for it to still be nice and fresh for the party on Monday? Should the cake left overs be refrigerated? Yes, definitely the cake should be refrigerated because the frosting is made with cream. Thanks to your strawberry cake,my husband and I decide to make one today! In my page I have the picture! I would love to share your photo. 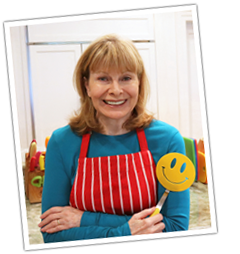 Please go to my blog to the “Your Photos / My Recipes” category and there is a link there to send a photo. I’m glad you like the cake. Thanks for sharing your recipe. 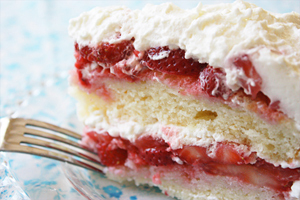 Strawberry cake is my most favorite .Your recipe is easy to follow. I will probably use frozen strawberries however. Can’t wait to make this cake. Sounds so easy and delicious! I would say day of. I will taste just as good the next day but it may not look as fresh. Happy Easter. I was wondering the same thing! We’re going to have this for Easter tomorrow. I’m thinking of making the cakes tonight, wrapping them in plastic wrap & assembling the cake tomorrow. Thoughts? Best cake ever. Only two of us and wish I knew IF adding some plain clear mixed hello to the whipped icing would have held it better for overnight. Wish you could experiment with that idea….the taste is superior anyway. I had a two layer cake at a funeral that seems so much like this. It was made in a disposable pan. I think it had been frozen to have on hand. It was so good! I never could get the recipe…I’m excited to try this! This is a fantastic cake! I made it for a dinner party last weekend and everyone loved it, including the kids! Made this for my daughter’s birthday party today. Almost nothing was left of it, but I’m about to lock myself in the bedroom with it so I can have it all to myself! I made this cake on Saturday for Mother’s Day. It was requested by my family. Every year I make dinner and desert so my mom and sister don’t have to. I made homemade baked ziti, salad, Italian bread and your awesome cake! Everyone loved it. My mom called me this morning at work to thank me for everything and she said she had some for breakfast!! Best cake ever! I made your cake the other night for a family gathering. THEY LOVED IT!!! And said to me…this one I have to make again.